No stop to the bullish sentiment on the market yet. Traders and investors betting on the best scenario that both parties will strike a deal. If a deal reached then stock market might continue its upward movement but with limited upside, as everything is priced in. On another hand, no deal will end the current bullish trend abruptly. Today, the market will observe core retail sales, PPI and retail sales data. Expectation see 0.0%, 0.1% and 0.2% increase monthly. Coca Cola (NYSE: KO), will report earnings before the market open. Asian stock market threaded cautiously today. Japan stock market down 4.77 points (-0.02%) to 21,139.71, China Shanghai Composite down 1.37 points (-0.05%) to 2,719.70, and Australia ASX 200 down 4.20 points (-0.07%) to 6,059.40. European stock market, on the other hand, takes the upside route. DAX Germany up 0.36%, UK FTSE up 0.25%, Euro STOXX600 up 0.44%. DJIA continue its upward stride and expected to extend the uptrend today. 25,750 – 26,000 is the resistance area to watch on the upside. We think the index will stall near the resistance and waiting for the result from U.S-China trade talk. Currently, optimism continues brewing and the market expects the good result will come out of the talk. NUE recent trend is bullish, however the share prices upward movement always limited below its daily SMA 200. Currently, the share prices are testing the averages. 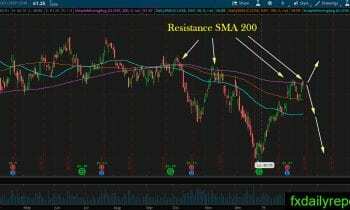 Will the share prices breakout above the resistance? Alternatively, will it rejected and start a new bearish leg? 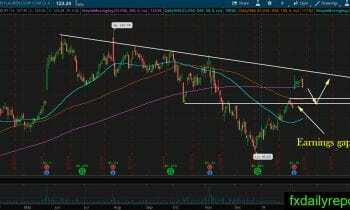 RL gapped up after recent earnings result. The gap crossed daily SMA 200 and maintain the level above it for several days. However, the bear manages to pull the share prices down and close below the averages yesterday. 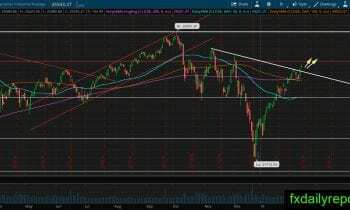 It is possible for the share prices to continue downward and close the earnings gap. After the earnings gap closed, RL might start moving up or moving down sharply.